The object never gets closer to the Sun than 65 times the Earth–Sun distance. 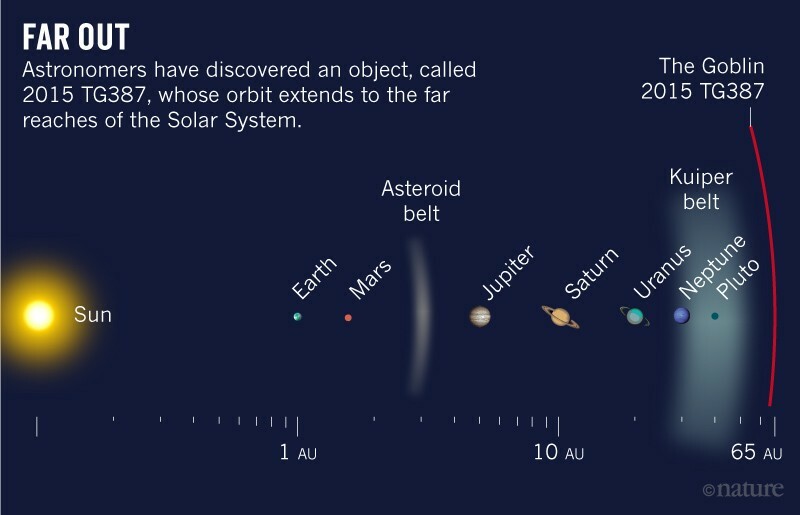 Astronomers have discovered a distant world in the outer Solar System. Named 2015 TG387 and nicknamed The Goblin, it never gets any closer to the Sun than about 65 times the Earth–Sun distance, or roughly twice the current distance between Pluto and the Sun. At its farthest, the object ranges out to 2,300 times the Earth–Sun distance (see 'Far out'). 2015 TG387 is one of only a handful of objects known in these distant realms. Its orbit is consistent with, but does not prove, the existence of a proposed big planet in the distant Solar System that is popularly known as Planet Nine. A team led by Scott Sheppard, at the Carnegie Institution for Science in Washington DC, discovered The Goblin using Japan’s 8.2-metre Subaru telescope on Mauna Kea, Hawaii. The researchers announced the finding on 1 October in a circular from the International Astronomical Union.